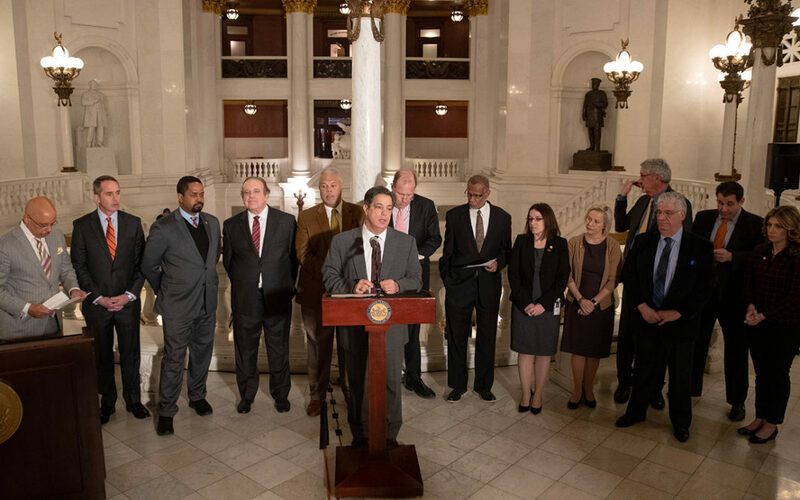 HARRISBURG, PA − January 16, 2019 −Members of the Senate Democratic Caucus stood together Wednesday, outlining the impacts of the federal shutdown on their constituents and addressing potential remedies at a state level. “In my county of Allegheny, we have about 150,000 folks who will be impacted by the change to SNAP benefits, and we want to make certain that they understand what they can do and what steps they can take during this federal shutdown,” said Senate Democratic leader Jay Costa. Senator Art Haywood stated that if the federal shutdown continues, there will be no SNAP payments for the month of February. “An additional component of this federal shutdown is the effect on science, and the effect on what we rely on to keep us safe and healthy,” said Senator Daylin Leach. Leach spoke to the fact that during the shutdown federal agencies such as the Food and Drug Administration are not doing their regular inspections of food, the Nation Oceanic and Atmospheric Administration is not tracking and publishing weather patterns, and many scientists who work for the federal government are leaving for the private sector jobs. Also in attendance at today’s press conference were Senators Andy Dinniman, Lindsey Williams, Steve Santarsiero, Anthony Williams, Maria Collett, Tim Kearney, Wayne Fontana, Larry Farnese and Katie Muth. For more information about Pennsylvania resources for those struggling during this shutdown of the federal government, visit pasenate.com/snap for more information. Watch full press conference below. Stay connected with "Pennsylvania Matters", an e-update, on state and local issues.